Telling scary stories or singing around the campfire, sleeping under the stars, and taking in the beauties of natures make lasting memories of family fun. Unfortunately, food poisoning, mosquito bites, and fleeing wild animals make lasting memories, too. 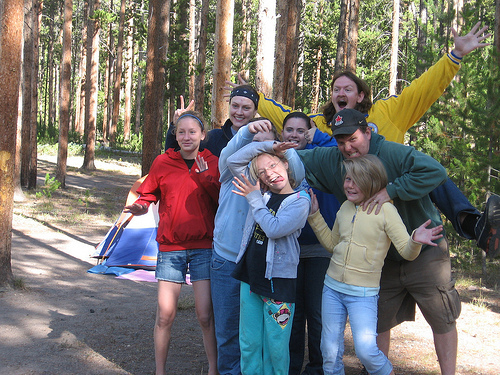 Here are seven simple tips for a fun and healthy camping trip that will keep your memories happy ones. Failures of refrigeration can occur without your noticing, but the bacteria that cause stomach upset may not be on all of the different food items in your cooler. Keeping different foods separate keeps the bacteria on one food from migrating to all the others. It is especially important to keep fruits and melons with rough peels or rinds away from other food items, since bacteria can hide in cracks and crevices on cantaloupes and citrus fruit. Use one cooler for drinks, another cooler for produce, and a third for meat. They will be easier to carry, and there will be much less risk of cross-contamination between meat, which you cook, and produce, which you don't. There is a long list of home remedies that actually work for taking the itch out of mosquito bites. Some people dab the bite with Benadryl cream, Calamine lotion, Bag Balm, Udder Balm, Gold Bond Medicated Cream, After Bite, or even Vick's VapoRub, usually reserved for treating chest colds, or Preparation H, usually reserved for hemorrhoids. Some people take an aromatherapy approach and carry little vials of lavender oil, witch hazel, sandalwood oil, cedar wood oil, or tea tree cream, the latter typically reserved for treating acne. And there are campers who use meat tenderizer, baking soda and water, crushed Aspirin and water, lemon juice, lemon slices, honey, and roll-on underarm deodorant to treat mosquito bites; we can hope they do not use them all at the same time. If you just don't have room for one more thing in your backpack, let your bar of soap double as your mosquito bite treatment. It will stop the spread of the itch, and anything tingly or perfume-y in the soap will act as a mild counter-irritant, much like Calamine. And if you are treating mosquito bites on kids, dabbing the bite with soap gives you a leg up on getting them washed before it's time to go to sleep. Bears typically don't wander into human habitat unless they are fed. If you are wandering into bear habitat, which is most of Canada and a very large part of the United States, don't leave food where bears can be attracted to it. And for the sake of both your own group and those following it, never, ever feed the bears. The nasty, untreatable diseases spread by ticks may not have a chance to spread into your body it you can remove any tick that has bitten you without breaking off its mouth parts into your skin, or squeezing its guts and saliva into the wound. Don't use a hot matchstick to remove a tick. Don't remove it with your fingers. Use straight-edged tweezers to remove the tick off the skin without twisting or squeezing. Don't be embarrassed by the possibility of needing to urinate in the woods. Drink water before you get thirsty to avoid dehydration. Children may need as much as 250 ml (about a cup) of fluid every hour, and teens and adults sometimes as much as a liter in severe summer heat. Despite the recent scares about sunscreen ingredients, a nasty sunburn is more likely to do harm to long-term health, especially long-term health of children, than the chemical ingredients of sun screens. Plan ahead and buy sunscreens with zinc or titanium oxide, natural ingredients that do not have any potential carcinogenic effects on the skin. Dr. Alan Greene, personal communication, 29 June 2011. Vick's Vaporub for coughing at night? Why and how to remove sunscreen at night?